Here you can find detail of Nano Glass. Home > Product >Nano Glass Countertop Marble Slab, 3 cm. Nano Glass Countertop Marble Slab, 3 cm. Super Nanoglass 3 Pedra , Find Complete Details about Super Nanoglass 3 Pedra, from Artificial Stone Supplier or Manufacturer-Xiamen Tianrun Stoneglass Import and Export Co.,LTD. Details of Nano Glass 3.0CM stone. Material quartz/composite, thickness 3cm. Click on a block option to view block images and details. Various Sized Nano Glass Countertop Marble Slab, 3 cm. Application and Other: First Quality, Luxurious, Natural, Carefully Prepared NSF Certified. We are factory of Nano Glass Marble, Marble Tiles, Nano Glass Kitchen Countertops, NANO GLASS 2CM SLABS POLISHED,NANO GLASS 3CM SLABS POLISHED. and any other cutomized size. widely used as wall cladding, facade, flooring, column/pillars, fireplace, countertop, vanity sinks/basin, vanity top so on. We are the leading manufacturer of Nano Crystallized Glass Stone.Includinng Jade stone,Nano crystallized glass stone and shining stone. 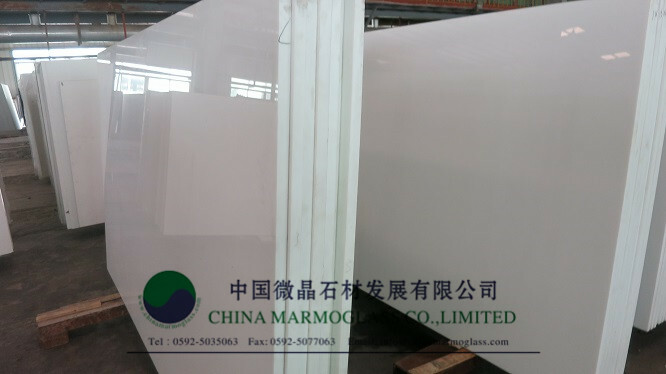 NanoGlass ( manufactured by China Marmoglass Co.,Limitedwww.chinamarmoglass.com ) is the new generation of Crystallized Glass Panel and updated from the Marmoglass GS001. With the combination of the Nano material with the natural stone, after the thermostatic hardening, polishing and smoothing, the stone material is produced in much higher density and gloss. The super Nanoglass is of granite material feature and marble’s gloss. Non-radioactive and environmental friendly, it becomes a new and reusable decorative building material. Super Nano2016 is the newest nano crystallized glass panel, it improve the cutting performance and hardness.And Super Nano2016 has high reputation among the global market with the stone-like quality. What is the feature of Nanoglass(Nano2018) ? 4). bath, Kitchen, any tops, round pillar and furniture decoration etc. Nano crystallized glass stone can be used for almost all commercial and residential surfaces including countertops,exterior and interior wall cladding,cabinets, fireplaces,vanity tops,kitchen tops,staircase,columns and floorings etc.Both big size and cut-to-size tiles can be provided. Copyright Right © 2015 Chinananoglass.com Powered By Chinananoglass Inc.